One of the most annoying and insidious creatures to plague homes is the ant. These creatures are industrious and determined workers. It is nearly impossible to drive them out of your home or destroy a colony once the queen has been chosen. One of the only ways to find peace is to dethrone her. The market offers a variety of chemical answers such as poisonous ant bait, toxic spray, and hazardous gels. Diatomaceous Earth is another solution; however, this one does not require filling the home and loved ones lives with poisonous chemicals. Diatomaceous Earth is fossilized phytoplankton which may also be referred to as diatoms. The DE is milled to a number of sizes, each being geared toward its intended purpose. There are generally two standard types of DE found on the market. One is often referred to as pool or industrial filtration grade and the other natural amorphous food grade DE . The food grade label indicates that it has not been treated with any chemicals or heat, is not contaminated with heavy metals and contains less than 1% crystalline silica. Food grade Diatomaceous Earth may be spread via a spray or sprinkled throughout the area of the infestation with a dusting applicator. As a side note, DE also eliminates a large selection of unwanted, pesky insects from your home. Though tiny these little diatoms are non-toxic they are deadly to insects. As the ants make their way to and from your kitchen, or any other room, they crawl through the DE dust. Each little particle has numerous minuscule, but razor sharp edges. These puncture the waxy exoskeleton which dehydrates the ant. It is safe to sprinkle Diatomaceous Earth throughout the home to reduce the ant population. Carpets, baseboards, counter tops, and cabinets may all be confidently dusted as well as any other area that ants find their way into the home. If the location of the colony is known, it is possible to eliminate the colony. Every ant in the colony does not have to be eradicated. Eliminating any colonies only requires the death of the queen. Generally, the rest of the ants will leave in search of a new queen and colony location. Generally outside on would use the Regular grade by inside the house it is better to use the finer powder such as our Superfine version which can be used in a our duster. 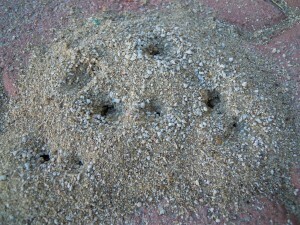 The entire colony and its nest can be destroyed with Diatomaceous Earth and a little determination. 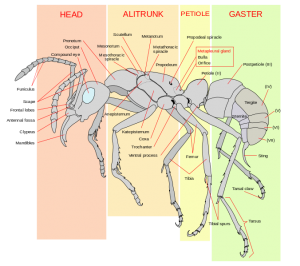 Locate the colony as well as all of its branched outlets. Generously sprinkle these with DE and note any ant trails leading away from the nest, especially those that lead back to the house. Be sure to also spread Diatomaceous Earth along the trails. It may take a few days to two weeks; however, DE will kill the entire colony. Keep an eye on the nest and its outlets for signs of life. 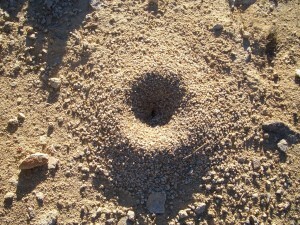 At the first sign that the ants are attempting to recolonize, thoroughly dust the areas again. Diatomaceous Earth Online offers an Aerosol Version which comes in a convenient spray can. The can contains enough powder which has been milled to smaller than 10um, to dust 200sq-meter area. It makes it simple to dust certain harder to reach areas around the home. DE, as previously mentioned, also works well to eliminate other insect pests such as bed bugs, cockroaches, and spiders just to name a few. Visit the website and take a look at all of the products that Diatomaceous Earth offers. Milled sizes range from microfine and superfine to regular grade. All of the DE products available on the website are safe, non-toxic, and food grade. They may be used safely in homes, on farms, and at work.